Great Quality Seasoned, Dry Cordwood / Firewood. Cut and split with cordwood processor on premises which can allow for custom cuts. What separates the quality of our wood from our competitors? 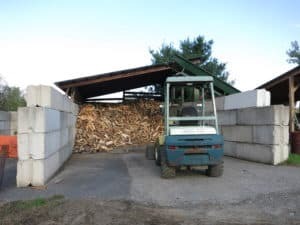 Our top quality Oak and Maple fire wood is stored in a covered location year round. And why is this so important? 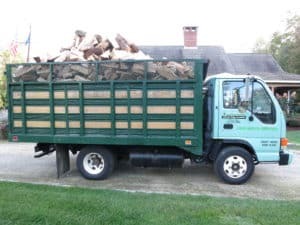 Because cut wood that is left out in the elements to continually get wet will never have a chance to fully dry and this greatly effects the aging and drying process. As a result, it just won't burn as well. Would you rather spend your money on a good product or a great one? We feel confident that once you try us out, you will never go back. We custom cut our cordwood to your desired length. With our own wood processor, we are able to “Custom Cut” if need be to satisfy your needs. Average size cut is 15”-18”. It's just one more reason we rise above our competition. We are based in Monson but we offer truck delivery to many local areas. What could be easier then having a cord of our high quality wood delivered right to your home? We offer delivery to Hampden, Wilbraham, Monson, Palmer, Brimfield, Ludlow, parts of Springfield and Chicopee. We may also deliver to your town so please contact us if yours is not listed. Our high quality wood will only run you $235/Cord plus delivery. 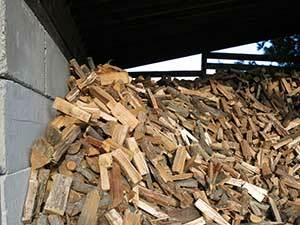 Here is a useful link to an article from Bayer Advanced that explains some basic tips on firewood. It touches on the difference between hardwood and softwood and why you should only buy local firewood. Check out the article here. Don't want to take our word for it?! Check out this video review one of our customers made explaining why he was so happy with his order from Full Service Landscaping. He had tried others but found that we definitely had the superior product. We think once you try our firewood, you will see the difference as well. By joining our mailing list you agree to sign up to receive emails from us every once in awhile. We will never sell or share your email and you have the option to unsubscribe at any time.